So apparently today is a public holiday, which I’m sure everyone except us realised this. I even drove my son to daycare this morning and to my surprise it was closed! So no new cartoon this week, sorry. Which brings me to my new years resolutions this year! 1) Try and always have at least a couple of back-up cartoons ready to go so I can occasionally have a day off or if something comes up. I’m aiming to try and have 2 cartoons done every Monday, at the least, finish one and have half another done. 2) Do more mid-week updates, if anything I plan on just posting up some random sketches, how does that sound? Sometimes I plan to do some writing and stuff, but at least I can throw up the odd sketch if all else fails. 3) To celebrate the 1 year anniversary of this blog I plan on giving the whole site a massive overall and update visually. I also plan to finally migrating this over to my www.brinkscartoons.com website, essentially replacing it with this one. I’ll still keep the old one there somewhere for prosperity. That’s it, well that’s my resolutions evolving this blog anyway, I have more, I’m just not sharing in case I fail them miserably. This cartoon is a really old one, you can tell by the really silly signature I had back then. God knows what I was thinking! This was early on in my career when I still had lettered…..strangely enough I only just recently started doing it again, and it looks way better than it did back then….ahhh progress. 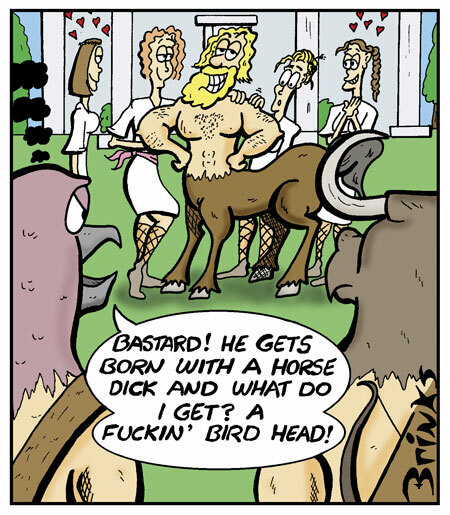 It’s an old one, but also it’s one of my favourites, I think because I have a thing for ancient mythology and I also enjoy drawing horses for some reason…..hmmm maybe I should do a horse comic strip, oh speaking of which I really should add a number 4 to my resolutions: “Start a comic strip”, I’ve always wanted to do a regular comic strip, is this the year?? Anyway, I hope you like this comic and I’ll be back next week with a new comic and I’ll try and do a mid-week update this week as well!